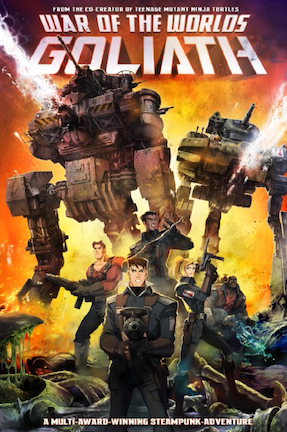 On the eve of WWI in a timeline altered by the Martian invasion of 1899, an international military squadron prepares to fight a new wave of alien attacks with steam-powered battle machines. Leeds 1899 – During the Martian invasion of Earth, Eric Wells watches in horror as an alien tripod disintegrates his parents. New York 1914 – Now a captain in the Allied Resistance Earth Squadrons (A.R.E.S. ), Eric commands a squad of international soldiers preparing for a possible second invasion from Mars. Eric’s unit consists of Lt. Raja Iskandar Shah from Malaya, Corporal Patrick O’Brien from Ireland, Sgt. Abraham Douglas from Canada, and Lt. Jennifer Carter of the United States, with whom Eric has a romantic relationship. Working with Professor Nikola Tesla and Secretary of War Teddy Roosevelt, General Sergei Kushinirov commands ARES from the airship Leviathan. Sergei assigns Eric and his crew to pilot Goliath, a new Achilles class battle tripod designed as a weapon against the Martians. On the eve of a war game scheduled between Eric’s team and another unit, the soldiers of ARES gather for drinks at The Green Man pub. Patrick excuses himself to meet in secret with his IRA brother Sean, who wants Patrick to steal ARES weaponry for their homeland’s separate rebellion against the British. Sergei interrupts the festivities at the pub to announce the assassination of Archduke Franz Ferdinand. With World War One imminent, all countries have recalled their respective military personnel. International rivalries flare at the news, but Eric unifies the soldiers with a speech about banding together to fight their common enemy of the Martians instead of each other. The next day, the war game is interrupted by the unexpected arrival of Martian tripods. Earth realizes that the second invasion has begun with attacks concentrated in North America, specifically Montreal, New Orleans, and New Mexico. Patrick refuses to steal from ARES to help his brother’s cause. Sean tells Patrick that his brother is dead to him. Raja later reveals to Patrick that he knew what Sean wanted weaponry from his brother, but Raja trusted Patrick to not betray ARES. Albuquerque, New Mexico – Goliath is dispatched to battle Martian forces in the American southwest. The Goliath crew teams with a mentally unstable soldier wearing his wife’s finger around his neck, who helps them infiltrate a Martian base and rescue kidnapped civilians. Eric and Jennifer share an intimate moment while repairing Goliath after their victory. Eric’s squad returns with the Leviathan to repel the larger assault in New York City. Teddy Roosevelt takes an active role in the battle by manning a laser cannon. Once the smaller alien tripods are defeated, a large Martian spacecraft rises from the water, destroying the Statue of Liberty in the process. The battle continues raging and seems lost for the humans when Sergei sacrifices his crew by steering the Leviathan into the spacecraft and destroying the Martians. In our world, the assassination of Archduke Franz Ferdinand in 1914 lit the tinder of World War One. The event would have done the same on the Earth of “War of the Worlds: Goliath” too, if its citizens were not already focused on repelling a second Martian invasion of the planet. 15 years after the tripod assault detailed in H.G. Wells’ venerable classic, Earth awaits the Martians’ presumably inevitable return with an international military force of soldiers, pilots, and steam-powered battle mechs reverse engineered from alien technology by Nikola Tesla himself. Secretary of War Teddy Roosevelt and Russian general Sergei Kushinirov command these Allied Resistance Earth Squadrons, otherwise known as A.R.E.S. Isolated conflicts between countries now seem trivial in light of the larger threat looming and it is up to Captain Eric Wells to lead an elite unit of multicultural men and women in fierce conflict against the alien oppressors. “War of the Worlds: Goliath” has enough ideas and characters to populate an entire animated television series, and perhaps it was once intended as such. An extended serialized format would likely have worked more favorably for what “Goliath” ultimately delivers, because everything the movie tries to accomplish does not quite fit into a feature film style. Despite rich source material and a steampunk-influenced imagination at its core, “Goliath” cuts a lot of corners that cause it to come across as a rushed project without a sufficiently developed universe. It starts with the heroes. Goliath’s squad leader Eric Wells is curiously the most vanilla of the bunch. In making him such a milquetoast Everyman, Eric is bland and not at all cut from leadership-quality cloth. Upon his first encounter with returned Martian forces, Eric freezes in his tracks as soldiers are disintegrated by death rays while vainly awaiting orders he is too panicked to give. The film is trying to throw out a callback to a moment from his traumatic youth, but douses him in ineffectual cowardice by doing so. Subplots come and go too quickly to warrant any meaningful investment of sustained attention. One of the military commanders loses his son in a clichéd moment when clasping hands lose their grip over a fiery chasm. Until the falling man said, “I love you father,” there was no indication that the empty-handed man even had a son, causing intended emotion to fall flat. Of the rainbow coalition populating Eric’s battle squad, only the brawny redhead from Ireland has a B storyline, which involves IRA cloak and dagger tactics to steal munitions from ARES for Ireland’s rebellion against the British. The rest of the characters are sadly interchangeable, and that includes the lone woman acting as Eric’s uninteresting love interest. “War of the Worlds: Goliath” is clearly in need of a greater playground to expand its threads. The confines of 85 minutes do not afford the right amount of space to open up its ideas and let loose. And “Goliath” does have ideas. The Gotham City in daylight deco fused with turn of the century industrial design makes for a unique vision of New York featuring a Statue of Liberty hoisting a sword instead of a torch. The Goliath itself resembles a cross between Metal Gear and a tank atop a three-legged AT-ST. “War of the Worlds: Goliath” is in possession of some cool concepts, although it glimpses them far too briefly to leave the lasting impression they should. “Goliath” is clearly hamstrung by an animation quality bar reminiscent of what was commonplace for a Fox Kids series in the 1990’s. Alien tripods and some of the machinery are rendered in 3D while the remainder is traditional 2D and cheap tricks like blurred background plates and reused cels. It is good enough for broadcast television quality, but not quite up to theatrical feature snuff. That limited scope in animation resources really hurts when the story is about a planetary invasion. Presumably to keep costs low and to simplify animators’ workload, some scenes are conspicuously underdeveloped, such as those where alien tripods are seen only three at a time and generally no more than half a dozen battle units ever appear onscreen at once. “Goliath” creates a vibrant vision of a reimagined New York, but then spends the middle act in a barren New Mexico canyon. That would not be as big of an issue except that the story describes massive attacks taking place in Montreal and New Orleans, and the viewer cannot help but want to see what that would look like instead of another laser blast firing into a rock wall. Feeling the magnitude of a large-scale alien invasion is next to impossible when the visuals are restricted to tiny battles set against monotone backgrounds. Some of the editing and animation, particularly several lackluster explosions, are rendered roughshod. And the voice acting is uninspired to say the least, as if everyone’s lines were recorded in one take upon a first read of the script. Yet with all of that said, it is also difficult to not appreciate what director Joe Pearson and his crew were going for, even if they were unable to fully realize what was no doubt a grander vision. “War of the Worlds: Goliath” cannot compete with a Dreamworks or Disney production, but it is still loaded with ambition and entertainment. The fiction mix of WWI history with H.G. Wells science-fiction is cleverly blended with real-life personalities like Tesla and the infamous Red Baron. And after seeing former president Teddy Roosevelt with buffed-up Popeye arms firing a laser cannon at mechanical Martian invaders, it becomes apparent that “War of the Worlds: Goliath” has enough fun ideas at its heart to overlook those concerns about its shortcomings. March 1, 2014 by Ian Sedensky.